The second conversion - movement to electricity - is accomplished in two fundamentally different ways by the microphones we can choose from. The first and oldest approach - the dynamic microphone - uses the principle of the electromagnetic generator - an electric current is induced in a wire moved across a strong magnetic field. 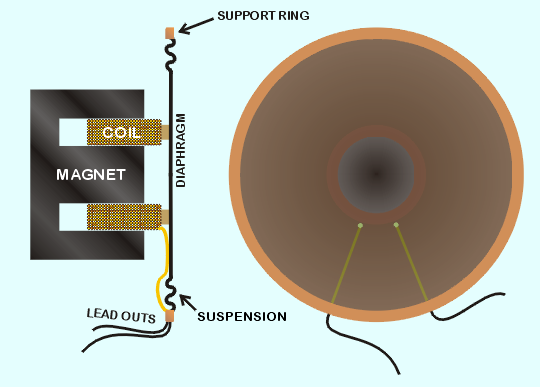 In a dynamic microphone this wire is formed into a coil attached to a circular diaphragm. As the diaphragm vibrates in response to sound waves, the coil moves with respect to a fixed powerful magnet. An electric current is induced in the coil which varies in strength and direction in proportion to the speed and direction of movement of the diaphragm - in effect, the exact reverse of a loudspeaker. Dynamic microphones have been used by stage performers for decades. They are extremely robust - well known for being dropped and swung around the head at rock concerts without apparent damage. They have the lowest self-noise of any production microphone, but their output is fairly low as well for a given strength of sound. That means more amplification is needed externally to bring the signal to a reasonable level, which will increase the effective noise level as the noise gets amplified along with the signal. The output of a dynamic microphone for a given sound pressure increases as the frequency of the sound waves rises because the electric current in the coil is proportional to the speed of its motion with respect to the magnetic field. This gives the dynamic microphone its characteristic "bright tone colour" or treble emphasis much loved by vocalists. But the frequency response of a real dynamic microphone is also affected by numerous other factors including the stiffness of the diaphragm, the mass of it and the coil and the flexibility of the suspension, so the frequency response usually exhibits a peak in the 8-12 kHz region rather than rising inexorably with frequency. Indeed the highest frequency a dynamic microphone will usefully respond to is often around 16 kHz. The wires that connect the ends of the coil to the leadouts can also interfere to some extent with the free movement of the diaphragm, making the frequency response somewhat uneven. But it's very difficult to overload a dynamic microphone. At extreme audio sound pressures the suspension resists excess movement of the diaphragm, resulting in relatively graceful degradation of performance. On the positive side for field use, dynamic microphones are almost completely immune to damp and very insensitive to wind. They are therefore good for sea shore recordings, but are less appropriate for bird song or distant - far field - recordings of woodland and open landscape use due to their low output and limited top end response. To eliminate the upper frequency limitation of the dynamic microphone, the ribbon microphone was developed. Instead of a diaphragm and coil, the ribbon microphone uses a single strip of incredibly thin aluminium foil - the ribbon - positioned within the field of a very powerful magnet. The ribbon serves as both the diaphragm and the electrical generator. Ribbon microphones have an inherently figure-eight response and are superb in the studio (if very expensive), but they are much too fragile for use in the field - even blowing directly onto the ribbon can damage it. So we don't use them for wild soundscape recording. The most widely used microphone technology today is the capacitor microphone. This uses the electro-static principle to generate a minutely varying voltage. It needs additional circuitry built in to convert this tiny variation into a usable signal, so it requires a power supply for the electronics. A capacitor is a device consisting of two parallel plates insulated from each other. If its two plates are at different voltages, it stores electricity as a static charge, and the amount of electricity it can store depends on the size of the plates, the size of the gap between them and the voltage difference between them. The capacitor microphone diaphragm is gold plated and forms one plate of a capacitor, the other rigid plate being attached to the opposite side of a hollow frame on which the diaphragm is mounted. A relatively high constant voltage - the bias - is applied between the diaphragm and the fixed plate. 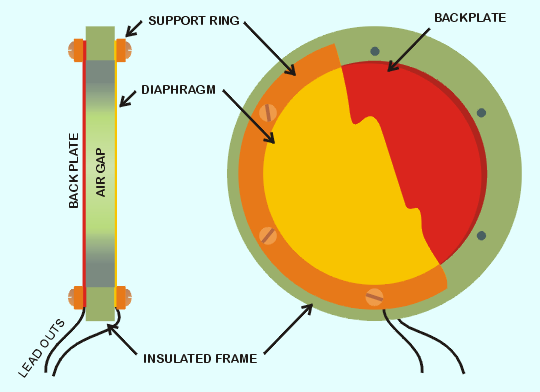 As the diaphragm vibrates under the influence of the incoming sound waves, the space between it and the fixed plate of the capacitor varies minutely. This changes the capacitance, causing a minute current to flow as the capacitor takes up or releases electric charge so as to restore it to the bias voltage. These tiny currents are converted to voltage and amplified by the electronics, resulting in an output signal. The gap between the plates is exaggerated in the diagram for clarity. In a real microphone it is very small - indeed small enough that under the influence of sudden changes in air pressure the diaphragm may flex enough to make contact with the backplate. This is called "bottoming out" and results in popping noises and silences in the microphone's output. Due to the lightness and flexibility of the diaphragm, this can occur quite easily. Capacitor microphones have various pros and cons compared with their dynamic cousins. They are not as robust physically, although there's less in it as the technology improves. They have much higher output levels for a given strength of sound and size of microphone, as the internal electronics amplify the signal significantly. The trade-off is increased self noise, as all electronic circuits generate some irreducible noise, although the best designs can be very quiet indeed. Capacitor microphones require a power supply - usually a nominal 48 volts at around 2 milliamps - but all professional and much high-end consumer recording equipment these days supplies this - phantom power - as a matter of course. Due to the need to maintain this fairly high voltage across the capacitor, the microphone may misbehave in the presence of condensation - or even damp if the diaphragm is allowed to get dusty. This is manifested by random repetitive popping sounds as the electric charge leaks away. Some makes and models are much more immune to damp than others, and a relatively new but very successful technique using a high frequency (ultrasonic) bias instead of a static voltage has virtually eliminated damp problems. Because the diaphragm is so light and flexible compared with that of a dynamic microphone, frequency response is excellent and can be very flat. But wind is a serious problem. It causes the diaphragm to produce a low frequency "flutter" noise or to "bottom out", resulting in short periods of silence interspersed by popping sounds. A large diaphragm capacitor microphone - three-quarter to one inch (1.9-2.5 cm) diameter - will flutter in the slightest draught and always needs a wind stopper for use in the field. However, given adequate protection, a good quality large diaphragm capacitor microphone is unsurpassed for wild soundscape recording.